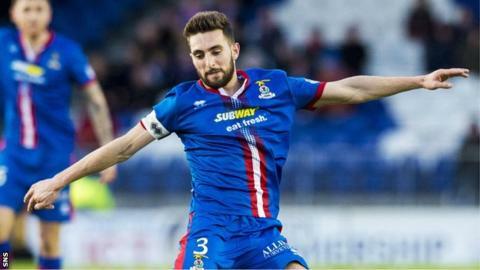 Inverness Caledonian Thistle defender Graeme Shinnie has signed a pre-contract agreement with Aberdeen. The left-back will move to Pittodrie in a three-year deal when the transfer window opens in June. The 23-year old opted to join his home-town club despite offers from English Championship clubs. Shinnie has been at Caley Thistle since 2009 and has made more than 160 appearances, and has been capped twice for Scotland Under-21s. Aberdeen may have preferred Shinnie to join them in the current transfer window. Their left-back Clark Robertson is injured, and Andrew Considine, who had been playing in that position, has been moved to central defence because of injuries to Ash Taylor and Russell Anderson, with winger Jonny Hayes moving back to cover.